This BooM BooM RooM Presents show,*DRAGON SMOKE*, has sold-out every show to date…every year in a row in New Orleans during JazzFest and also in San Francisco for more than 16 years! DRAGON SMOKE has crowds and lines down the street (all night long) each and every night they perform. This band is super hot! 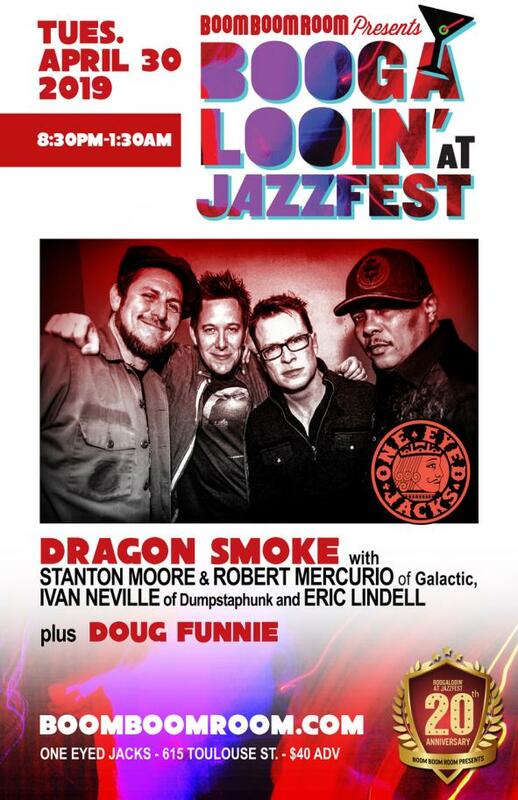 Dragon Smoke is a band that formed as part of Boom Boom Room Presents’ New Orleans Jazz Fest tradition known as the “Superjam”. The “Superjam” idea is to put together a band of people who don’t normally play together and see what happens. With the dual vocals of Neville and Lindell, matched with the Galactic rhythm section, the band quickly realized, “We are on to something”and has played every Jazz Fest since its inception in 2003. This inception took place at the famed Dragon’s Den, hence the name of the band. The music centers around Lindell’s blue eyed soul , Neville’s funk and R&B, and Galactic’s groove. Besides a few trips to the West Coast, this band has been strictly playing in New Orleans. With everyone in the band being a leader on their own, it is rare to get this band together. And when it does, it shows that these guys are really having FUN! From the interplay between the members, you would think that Dragon Smoke has been playing shows forever. Dragon Smoke is looking towards the future, with plans to write and record an album and to do more touring outside of New Orleans and the Bay Area. So be on the lookout for the Smoke—IF YOU SEE SMOKE, YOU KNOW YOU WILL SEE FIRE! So, don’t miss this one! *DRAGON SMOKE* performs at ONE EYED JACKS on Tuesday, April 30th 2019 bringing its stellar style of dirty-south funk and new New Orleans R&B Rock in what is a kick-azz rockin’ show from start to finish! The music of DRAGON SMOKE truly represents the New Orleans Funk, R&B and Soul tradition. It’s a phenomenal band. Don’t miss this one!